ESPN executive Traug Keller discusses Colin Cowherd's departure from the world wide leader to Fox Sports, plus the future of ESPN radio. Traug Keller says ESPN did everything it could to retain Colin Cowherd. When the radio host suggested he wanted to move his base of operations from Bristol, Ct. to Los Angeles, ESPN management greenlit the proposal. Extra television opportunities? You bet, the company said. Keller, a longtime ESPN executive, would know the details of such contractual negotiations. The senior vice president of production business divisions oversees all aspects of the ESPN’s audio business including talent, staffing, national programming content, scheduling and event production. He’s also enjoyed a good relationship with Cowherd since hiring the host in 2003 to replace Tony Kornheiser for the late morning time slot on ESPN Radio. But while ESPN’s offer was aggressive, it was not enough. Last week The Big Lead’s Ryan Glasspiegel broke the story that Cowherd was leaving ESPN at the end of his current contract. While an official contract has yet to be signed as of this writing, Cowherd is heading for Fox Sports as Keller’s quote above indicates. Negotiations are currently finalizing between that network’s brass and Cowherd’s reps. One of the questions remaining for Fox was whether ESPN would let Cowherd out of his contract early, keep him on air until the end of his contract, or pay him to sit on a California beach until his contract’s end. Keller would not confirm an end date for Cowherd but he did say it would be an amicable parting. I’m told Cowherd’s ESPN contract ends in December but he’ll be off ESPN well before that. If you are looking for a starting date for Cowherd at Fox Sports, keep this in mind: Cowherd has a book coming out Oct. 1 and I’d guess he’d want to be at his new employer to promote that (as well as having his new employer promote the heck out of the book). Based on multiple industry sources I spoke with, the Fox Sports salary they anticipated for Cowherd was north of $6 million annually when you include radio and television work. What will Cowherd do for his new employer? Here’s some informed speculation after four days of speaking with people inside and outside of Fox Sports: Look for Cowherd to host a nationally syndicated show on Fox Sports Radio that's fully simulcast on Fox Sports 1. I’d also look for him to have a separate 30-minute or 60-minute presence on Fox Sports 1. Glasspiegel reported that one potential idea would have Cowherd on FS1 at 6 p.m. ET to compete with SportsCenter. Two Fox sources confirmed such an idea is being kicked around. Fox hiring Cowherd will reunite the host with Jamie Horowitz, his former boss on ESPN’s Sports Nation who last April was brought in by Fox to oversee all programming, marketing and scheduling for Fox Sports 1 and Fox Sports 2. Horowitz is currently kicking around a ton of pilots for both networks, presumably some involving two hosts screaming and blaming LeBron James for the Greek economic crisis. As for Cowherd’s replacement, multiple sources told SI.com that The Dan Le Batard Show, which currently airs on ESPN Radio from 4-7 p.m. ET, is the frontrunner to take over Cowherd’s morning 10-1 p.m. spot. That would cause an opening in Le Batard’s current spot, with multiple in-house candidates being kicked around including Bomani Jones, who currently hosts an ESPN Radio show from 9-11 p.m. The choice of Le Batard makes a lot of sense internally for a number of reasons. First, ESPN president John Skipper is personally fond of Le Batard and has said so in interviews with this column. Second, Le Batard is key talent figure in Rydholm Projects group, the company led by producer Erik Rydholm that produces Highly Questionable, Around The Horn and Pardon The Interruption in partnership with ESPN. Rydholm’s shows build on each other to funnel into what ESPN management considers its most important property in SportsCenter and whether he wants to admit it or not, Rydholm is the most powerful producer at ESPN. If you regularly appear on Rydholm shows, you can feel comfortable buying, as opposed to renting, that two bedroom loft in Brooklyn or Miami. But just because ESPN management thinks Le Batard is a good fit by no means assures it will happen. Le Batard and Jones work on Highly Questionable, which tapes at 12:30 p.m. ET (the slot Cowherd currently hosts). That show is very important to Le Batard and Rydholm, not to mention ESPN’s TV side. Also, keep in mind Le Batard and his radio show have spent years establishing an audience during the drive-time hours in Miami. That’s something that group might not want to screw around with. It also seems inconceivable that Le Batard would make any move that has a negative impact on the television show he does with his father, Gonzalo. As for Jones, he does a lot of spots on Around The Horn (which tapes at 1:30 p.m.) so that’s also a factor with him. I believe Keller when he says nothing has been finalized. Keller then rolled off a number of additional ESPN Radio names from Jones to the L.A.-based Max Kellerman and Marcellus Wiley to the Chicago-based duo of Tom Waddle and Marc Silverman to the New York-based ESPN Radio show featuring Michael Kay and Don La Greca to Michael Smith and Jemele Hill, the hosts of ESPN2’s His and Hers. So file those names away, too, as part of a radio chessboard. “We have strong ideas but I am not ready to talk about it right now,” Keller said. For those who think ESPN Radio is going to fall off a cliff from 10-1 without Cowherd, guess again. The person or persons who replace Cowherd will essentially be given a Wonka Golden Ticket. Cowherd’s show airs on 400 terrestrial radio stations, Sirius XM, iTunes, Slacker, Tune-in and is simulcast on TV. On the topic of other ESPN Radio shows, I’ve been told by a number of ESPN staffers that the relationship between ESPN management and Mike Greenberg and Mike Golic has been chilly since management pulled out from the plans of moving them to New York. In a splashy announcement at the ESPN upfronts for advertisers in May, ESPN said Mike & Mike would originate from ABC’s Times Square studio beginning Feb. 8, 2016, the day after Super Bowl 50. Keller said he recently had a long conversation with Golic, which he characterized as excellent, about the future of the show, and said Mike & Mike “is firing on all cylinders.” Keller said ESPN is committed for the long term. “It’s one of the great morning shows in radio,” Keller said. Keller declined to comment on the futures of Jen Lada, the Chicago-based Comcast Sports Net anchor and reporter who had been scheduled to join Cowherd’s show, and NFL Network's Molly Qerim, who had been announced as the third person on the rebranded, New York-based Mike & Mike. But look for both women to land at ESPN with regular assignments. Qerim, for instance, has been serving as the interim moderator at ESPN2’s Shawshank Prison (First Take). 1. 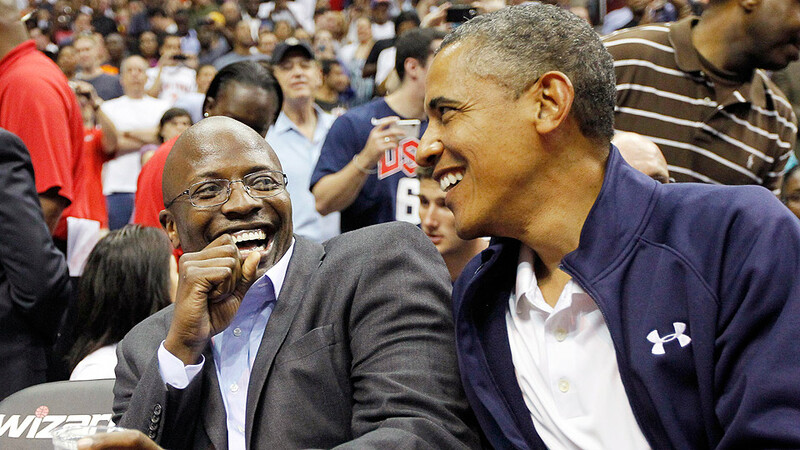 Reggie Love says Barack Obama did not write him a letter of reference for his new job as the brand ambassador and editor at large at VICE Sports. From 2007 through 2011, Love served as the special assistant and personal aide to Barack Obama, a position commonly referred to as “body man.” He left the White House in 2011 to complete his Master of Business Administration degree at the University of Pennsylvania's Wharton School. Prior to his White House stay, Love played basketball at Duke and was on the 2001 team that won the NCAA national championship. He also played wide receiver for the Duke football team. Love said he wanted the job because he loves sports. He was hired by Alyssa Mastromonaco, the chief operating officer of VICE and a former Deputy Chief of Staff for Operations. VICE Sports launched June 2014 and this April it added local editions in Germany, Spain and England. A company spokesperson said expansion will continue to Australia, Brazil, Canada, France, Italy and Latin America later this year. Last month, along with adding Love, VICE Sports announced that senior staff writer Jorge Arangure Jr. had been promoted to editor-in-chief and Caitlin Kelly, formerly of the New Yorker, had been hired as managing editor. I asked Love if there were any similarities between Obama and Mike Krzyzewski, the coach Love played for while at Duke. Love published a memoir earlier this year, Power Forward: My Presidential Education, which described his years at the White House. He said Obama would watch every Bulls and Bears game, as well as most NBA games, if they were airing while traveling on Air Force One. Obama is a noted basketball fan—he and Love played often at the White House—and I asked Love for a scouting report on the President’s game. “The best thing about his game is that he cares about winning more than his own statistics,” Love said. “He’s a guy that makes everyone on the court better. His actual game, his physical ability, I don’t want to give it away because if someone blocks his shot, he will be like, 'Why are you giving everyone the scouting report on me?' But he is savvy, and he’s surprisingly in very good shape for an older fellow. Does Obama’s game compare to any current of former pro? “I didn’t meet him until his mid-40s,” Love said, “so I have no idea what his game was as a young man, but I would say of guys that I played with, his jump shot almost looks like Johnny Dawkins’ jumper." 1a. Last week ESPN and the NBA announced that ABC will air an eight-game package of NBA games on Saturday night. The series will tip off Jan. 23, 2016 and run twice a month through the rest of the season, with games starting at 8:30 p.m. That means ABC and ESPN will now combine to televise NBA games on Wednesday, Friday, Saturday and Sunday. No commentators have been selected for the Saturday package of games. Under its current rights deal with the NBA, which expires after next season, ABC was scheduled for 16 games. Instead of airing doubleheaders on Sundays, ABC will now air one on Saturday nights and one on Sunday afternoons. Per usual, ABC's NBA schedule begins with its Christmas Day doubleheader. 2. The optimist—or someone who works for Major League Baseball—will tell you that baseball's All-Star Game remains the best-rated all-star game of the four major North American pro sports leagues. The pessimist would say something else: The All-Star Game ratings are tanking. Fox drew an average of 10.9 million for this year’s All-Star game, down from last year’s 11.3 million, 10.96 million in 2013 and 10.89 million in 2012. Fox noted in a release that the 10.9 million viewers fell within the 10.897 – 11.338 million range established for the last five MLB All-Star Games but that’s a significant decrease from 14.6 million in 2009 and well down from 16 million in 2001. Outside of a controversy or something unforeseen in the marketing of its stars, there’s no impetus to suggest the numbers will ever go back up to early 2000s levels. 2a. The top TV markers for the All-Star Game: 1. Kansas City; 2. Cincinnati; 3. St. Louis; 4. Pittsburgh; 5. Dayton; 6. Detroit; 7. Sacramento; 8. Minneapolis; 9. Columbus, Ohio; 10. San Diego. 2b. ESPN’s Home Run Derby broadcast averaged 7.1 million viewers, the most-viewed and highest-rated Home Run Derby since 2009 (8,250,000 viewers). Viewership was up 32% (5,402,000 viewers) from 2014. 3. The 11th episode of the SI Media Podcast features ESPN reporter Shelley Smith. In the podcast Smith discusses her public battle with breast cancer, ESPN nearly dropping her in 2014, being a woman in her 50s on sports television, counseling colleague Britt McHenry after McHenry appeared on a videotape berating a tow-truck operator, producing an upcoming 30 for 30 on the 2006 college football national title game between Texas and USC and missing Stuart Scott and Bryan Burwell. A reminder: you can subscribe to the podcast on iTunes, and you can view all of SI's podcasts here. • From CJR’s Anna Clark: This month, one of the best baseball reporters will be inducted in the Hall of Fame. Trouble is? He's unemployed. • ESPN’s Ramona Shelburne and Tim MacMahon on how DeAndre Jordan went from the Clippers to the Mavericks to the Clippers. • From The Harvard Journal of Sports & Entertainment Law: Without Consequence: When Professional Athletes Are Violent Off the Field. • Tom Verducci took a road trip from Las Vegas to Santa Clarita with Pete Rose. His story from the mag on it. From Vice Sports: Life as a transgender high school athlete. • Via The New Yorker: An earthquake will destroy a sizable portion of the coastal Northwest. The question is when. I cannot encourage you to read this piece enough. • This story by Michael Vitez is about a remarkable 18-year-old who had every bad hand dealt to her and overcame it. • From Vox: Watch: 2 Russian men held hands in public. People reacted horribly. • Via The Washington Post: The homeless man who went to Harvard Law with John Roberts. • From Ron Judd, Walker Orenstein and Miguel Otárola of The Seattle Times: The high schooler who survived a plane crash. • Excellent piece by Mairead Small Staid on the NXT Revolution in women's wrestling. • From Patrick Radden Keefe: El Chapo Escapes Again. • Nicholas Winton rescued 669 children from the Holocaust. They share their stories. • From Caitlin Gibson of The Washington Post: This judge mentored a quadriplegic man. Then he helped her through her own spinal injury. • Via Ian Urbina of The New York Times: Few places on earth are as free from legal oversight as the high seas. 5. The ESPYS, appearing on ABC for the first time in its 23-year run, drew 7.7 million viewers, a 250% increase over last year’s audience (2.2 million) and also up dramatically over 2013 (2.5 million). ESPN said the show grew by 1.9 million viewers (6.6 million to 8.5 million) from the first hour to the final hour, when Caitlyn Jenner’s speech occurred. Here’s my piece on it. 5a. ESPN's John Saunders offers to pay for Eric Garner's tombstone. 5b. Real Sports’s next episode (Tuesday, 10 p.m. ET/PT) investigates domestic violence among pro MMA fighters and efforts by MMA organizations to address it. It also includes Christy Mack telling her story for the first time on television. 5c. Sean Grande, the excellent play-by-play announcer of the Celtics, was hired by Bellator MMA to call its bouts on Spike. Grande is in his 15th year of calling the Celtics. 5d. Sports Business Daily reporter John Ourand spoke with new head of ESPN’s affiliate group, Justin Connolly, about the challenges facing his company. 5e. Van Miller, who called Buffalo Bills games for 37 years, passed away on Friday night at 87. On a personal note, when I was a young dude with zero profile covering the Bills, he was extremely generous and kind. Rest In peace. 5f. A website has been set up for the sons of the late Darryl Hamilton, the former major leaguer and MLB Network analyst (darrylqhamiltonfund.com). On Aug 11 there will also be a Darryl Q. Hamilton Golf Tournament in Milford, CT. Donations will directly benefit Darryl's sons. 5g. Fox Sports 1 coverage of the USMNT’s 1-1 draw with Panama drew just under 1.1 million viewers, becoming the most-watched non-FIFA Women’s World Cup soccer match in FOX Sports 1 history. 5i. Some thoughts from Twitter followers about who should replace Cowherd. 5j. ESPN’s live telecast of Round 4 of The Open at Scotland’s St Andrews will begin at 6 a.m. ET (11 a.m. in Scotland) on Monday. There will be a three-hour re-air Monday at 7 p.m. ET on ESPN2. 5k. As I’ve written before, I’m not a big golf watcher but I do try to watch the majors. On Sunday I was away from a TV so I listened to ESPN Radio’s coverage of the event and really came away impressed by the production and specifically the solid work of the announcing team. Full marks to Doug Bell, Dennis Paulson, Bill Rosinski and Bob Wischusen.